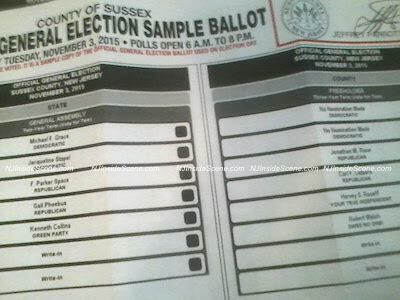 Sample ballot, courtesy of the County of Sussex. Starting from the top, a rundown of the candidates for the Legislative District 24 seats include Michael F. Grace and Jacqueline Stapel from the Democratic Party and F. Parker Space and Gail Phoebus from the Republican Party. Green Party Candidate Kenneth Collins is also in the running. The five candidates are in the running for two seats. At the county level, there are no Democrats running for the Freeholder race. On the Republican ticket are Jonathan M. Rose and Carl F. Lazzaro. There are two independents for Freeholder, Harvey S. Roseff and Robert Walsh. These four candidates are competing for two seats. 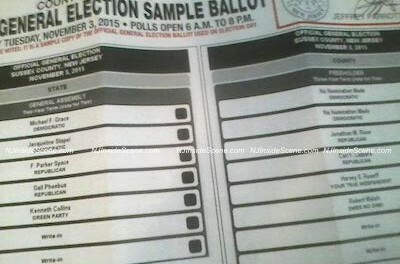 Click here for the candidate list from the Sussex County Clerk’s Office. Andover Township – There are no Democratic nominees for Township Committee, however, on the Republican Ticket are two, Ellsworth E. Bensley, Jr. and Janis McGovern. Michael Lensak, who had lost in the primary to both Bensley and McGovern (McGovern took the lead of all three) is running again for a committee seat as a write-in on the ballot. The three candidates are vying for two seats. Franklin Borough – On the Democratic ticket is Patricia N. Rowett running for the seat of Mayor with Nicholas Giordano with the Republican ticket. Giordano won the nomination during the Republican Primary in June. There are no Democratic contenders for council seats, but Michael Rathbun and Gilbert J. Snyder are running as Republicans. Montague Township – In the county’s most northern corner, Democratic and Republican candidates face off for three-year terms on the Montague Township Committee. In the Democratic corner are Arthur Henn and Harry I. Space II. For the Republicans are Gene L. Crawford and Paul M. Brislin. There are two seats available. Sussex Borough – For the Mayor’s Seat, Katherine A. Little is on the Democratic ticket, with Maria Krynicky running on the Republican side. For Borough Council, Albeert Decker is running as a Democrat for the three-year term with Edward J. Meyer and Linda A Masson for Republican for the same terms. For one-year terms are Gail Anne Zubi for the Democrats and Franklin Dykstra for Republicans. There are two seats for the three-year term and one seat for the one-year term. Vernon Township – In Vernon Township, the race for Mayor is a non-partisan one between incumbent Mayor Victor Marotta, with challengers R. Gary Martinsen, and Harry J. Shortway. There are two open seats on the Vernon Township Council and four candidates. Dan Kadish, incumbent, is seeking reelection. There are three new candidates, Edward Snook, Sandra Ooms and Edward Nitch. High Point Regional – Candidates are: Deborah L. Anderson (Branchville Borough), Michael Voitcu (Frankford Township), and Todd K. Miller (Lafayette Township) all for three-year terms. For two-year terms and both from Wantage Township are: Wayne Dunn and Nicholas D’Agostino. One candidate wins the seat from each category. Hopatcong Borough – Candidates all for three-year terms, running for three seats are: Pholip DiStefano, Judith Antonelli, Aristides G. Amador, Candice Smith, Ruth Fouda, Carol M. Trumpore, and Denise Gaccione. Sparta Township – There are four candidates running for three seats. They are: Linda M. Curcio, Karen Scott, John Surdoval and Carey Anne Gluck-Bomensatt. Stanhope Borough – There are three candidates running for two seats that are three-year terms. They are: Regina Thomas, Gilbert Moscatello and F Frank Shay. There are two who are running for two-year terms unopposed for two seats: Najib Iftikhar (who is also running against incumbent mayor Rosemarie Maio as an independent) and Mattia Scharfstein. One is running for a one-year term unopposed, Daniele Ferrone. Sussex-Wantage Regional – There are three seats for three-year terms, with six candidates, Daniel Wask, Robert Maikis, Ryan Coyle, Robert E. Osborn, Jr., Amber Simons and Susan Langan. Vernon Township – There are five candidates running for three seats that are three-year terms. They are: Theresa Scura Coughlin, Justine VanBlarcom, Bradley D. Sparta, William J. Higgins and Robert P. Hughes. While each municipality may have its own ballot question, there is one county question that is on the ballot for this year. That is the Sussex County Farmland Preservation, Recreation and Open Space Trust Fund. This enables the county to acquire farmland within its borders for preservation and open space at 1.5 cents per $100 of total property value. If voted on as a “yes” this program will continue until Jan. 21, 2026. This is something voted on once a decade. If the “no” vote carries, this tax will expire and the program will be discontinued. 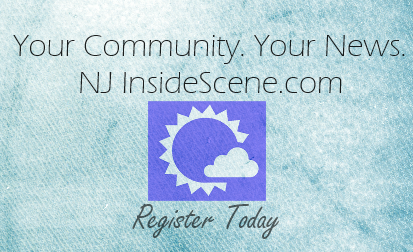 Continue to stay on the scene with NJ Inside Scene for election results. Click here to follow us on Facebook.